How sad is this? I honestly feel just awful. I seriously started this book review over 5 times. That’s right kids, OVER 5 TIMES! I was given a copy of “Thou Art That: Transforming Religious Metaphor” by Joseph Campbell. It’s collected from previously unpublished work. 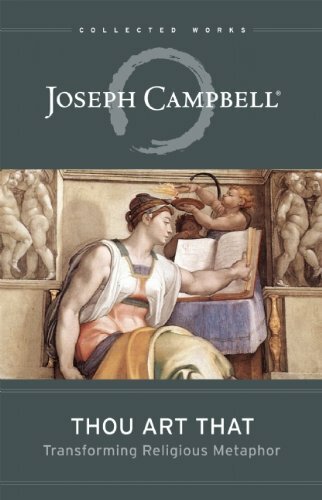 It does what Campbell does best, compares the Judeo-Christian faiths similarities and misrepresentations with scholarship that is authoritative, yet a dummy like me can understand. “Tat tvam asi” is a phrase that appears often in these collected spiritual reflections of the late Joseph Campbell. These words also inscribe a signature of celebration on his life and work. Translated from the Sanskrit as “thou art that,” this epigram captures Campbell’s generous spirit just as it does his scholarly focus. The great student of mythology not only understood the profound spiritual implications of the phrase but, quite unselfconsciously, lived by them as well.